Even though CrunchTravel might seem like a program worthy of having active on your PC, you should be aware of the fact that it is one more adware program that is promoted in a devious way. Often users are tricked into downloading and installing it because its creators advertise this application as a useful tool that should improve your online experience. Unfortunately, this ad-supported program will only do the complete opposite of that; it will cause tons of disruptions virtually every single time you decide to surf the web. For as long as this adware remains fully active on your PC, your online experience will be ruined in different ways. Additionally, this dubious piece of software software could operate in potentially malicious ways as well; thus, it could turn out to be a major virtual threat. Malware experts working at our internal labs highly advise you to completely delete CrunchTravel as soon as it is found running on your personal computer. Read the rest of this article to know more about the questionable functionality of this adware and to learn how you can remove it without encountering major problems. The overall functionality of CrunchTravel is not that different compared to other similar adware programs. This invasive application relies on a dubious system service, that it silently starts, to present you with suspicious web content. The invasive service will initiate quite a few connections to a large number of adware servers, which are infamous for providing all those suspicious coupons, pop-ups, and ads. It should be more than obvious that your web browsing experience will be affected in a negative way since tons of such ads or coupons, will constantly interfere with your daily online activities. Because the whole functionality of this ad-supported program is random, at times, you might be presented with so much of invasive web content that you might not be able to use your web browser at all unless you close down each ad and pop-up yourself. If you want to surf the web the way you are used to, you must execute a complete removal of CrunchTravel. This is imperative since just ending the system service via a Task manager will not help you stop the intrusive activity of this adware program entirely. Do not hesitate and execute its complete removal by following the detailed removal guide that we provide below. On top of all that, this adware program also exhibits some potentially malicious features of which you should be aware. 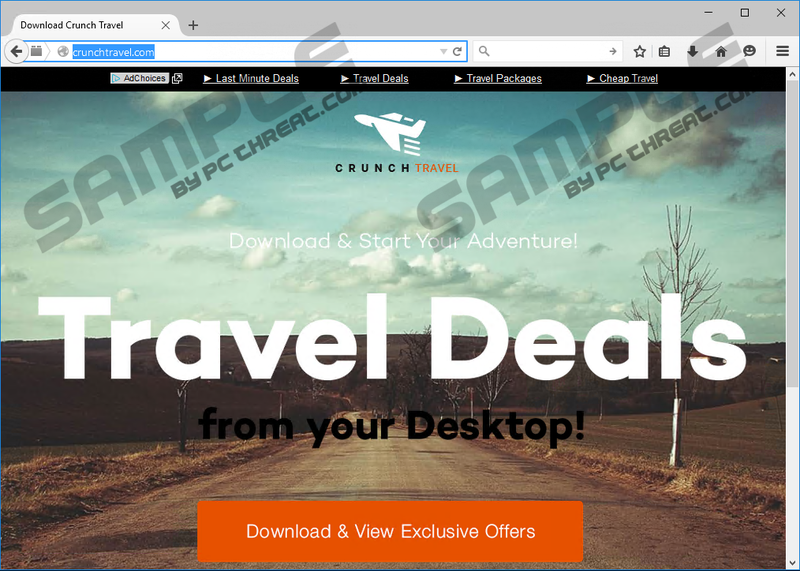 In some cases, CrunchTravel could present you with dubious ads that might be hosting redirect links, which could lead you to suspicious third-party sites. This is the major reason we highly advise you to bypass any ads, pop-ups, or coupons, that this ad-supported program might present you with. If, unfortunately, you happen to click on an ad implemented with a redirect link, you should know that you could end up on sites created by malware distributors. At times just entering such a site could be more than enough to get your operating system infected with some suspicious program, since some of these websites might have an active arbitrary code execution exploit. In other cases, you could end up on questionable third-party online shops. Such online stores are usually crafted by cyber crooks to steal your credit card data. It goes without saying that entering any of this website could have detrimental consequences. The intrusive and potentially malicious features of CrunchTravel are the main reasons we highly advise you to delete it at the very same time that you find it up and running on your PC. Fortunately, the whole removal procedure of CrunchTravel is not too complicated, and even users without advanced computer knowledge should not encounter major problems. It is important to get rid of this adware program completely since just a few leftover files, or registry entries could be used to restore it in a silent manner. Avoid getting yourself in such a situation by running an in-depth analysis of your PC for potential traces linked to CrunchTravel. If you find manual removal and analysis of your PC too complicated, you should delete this adware program by using a professional malware detection and removal tool. Select CrunchTravel and click Remove. Quick & tested solution for CrunchTravel removal.